Impressions: It Really IS Spring! 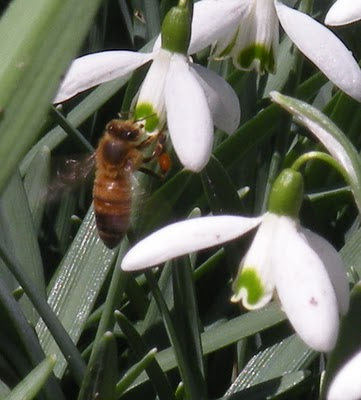 The honeybees are very busy on the snowdrops and here come the daffodils. Coltsfoot can be found in every, little wet ditch lifting itself up on stems which look to me like delicate fawn legs. It is really, truly spring! We went back down to Lake Romona on Clear Creek and this time it was the peepers and the wood frogs that got our attention. Boy were they loud! Jim was the first to notice the first butterfly of spring, the Mourning Cloak, on some mountian laurel. 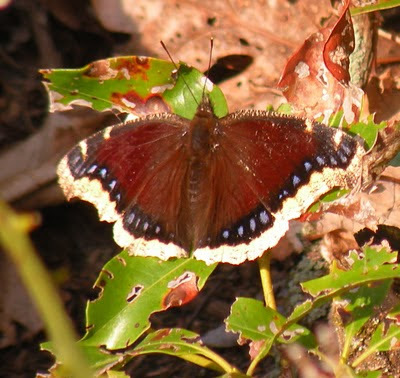 This amazing, fuzzy looking butterfly flutters to life sometimes before spring is officially here. It can do this because it over wintered as a hibernating adult.